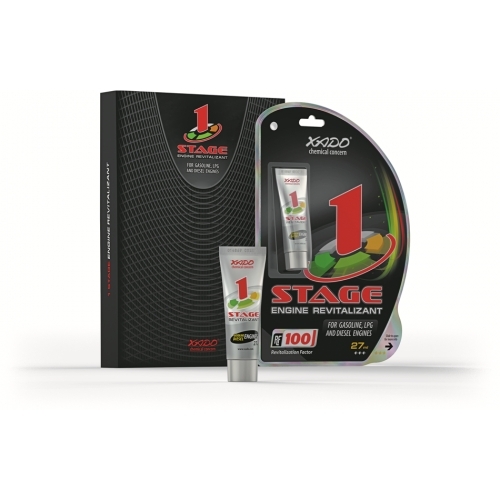 XADO 1 Stage Engine Revitalizant is a 1-step engine treatment that rebuilds metal and protects worn metal from future wear. One 27ml bottle contains enough active ingredient for a complete 100% (RF100) cycle of revitalization for an automobile engine. The difference between this product and 1 Stage Maximum Atomic Metal Conditioner is this product is only the raw, active ingredient – Revitalizant – in gel form. Revitalizant has been independently tested and proven to increase compression, decrease fuel consumption, increase horsepower, and reduce toxic emissions. 1 Stage Engine Revitalizant needs to be added only ONCE for 62,000 miles of protection.